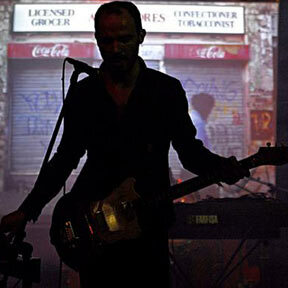 Electronicat is the pseudonym of French musician Fred Bigot. Started in 1998, Fred picked up his guitar, sampling it and focusing on the melodic attributes of beat, developed the particular sound he is now renowned for. The distorted but melodic guitar, the unquantised rhythms, the delay-heavy vocals and the buzzing rumbling 808 bass drum have all became characteristic features of the Electronicat sound. His songs encompass an array of influences in all respects - particularly glam rock, psychedelia, 60s garage rockabilly and experimental electronic music - and takes it further making electronic music sound more rock n roll. Electronicat has performed in a variety of locations all over the world (Knitting factory, Belgrade's Dis-patch festival and the Borderline Media Arts festival in Beijing to name a few). To date he has released seven albums on diverse labels (Onitor, Disko b, Kompakt, Ersatz Audio...) with his productions being featured on numerous compilations ('The Trip', 'The Other Side of New York'...). He has collaborated with numerous artists and musicians, building up an impressive resume that includes projects with Beans, Gerhard Potuznik, J.G Thirwell, Khan, Kasper T.Toeplitz, Anu Pennanen, Cecile Babiole, Nicolas Moulin, remixes for Depeche Mode, Tigerbeat 6, Bretzel Göring and also work with choreographers such as Mark Tompkins and Christian Rizzo.